The Airedale Group acquired South Coast Catering UK (SCCUK) in 2014 to significantly boost the Group’s service and maintenance offering. Since then, turnover has doubled and so has the number of staff in both support at our national call centre in Weymouth and on the field, with over 70 engineers directly employed by us nationwide, including in Scotland. This has now transformed our Airedale Service & Maintenance division into one of the largest independent service providers in the UK and has allowed us to both bid for and secure prestigious preventative maintenance contracts for some of the leading companies in the country. 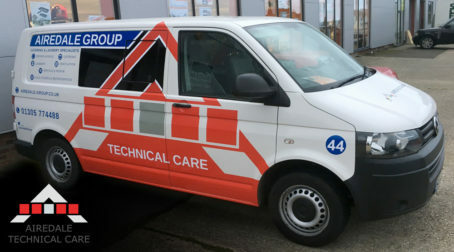 To cement SCCUK as part of the wider Airedale family, the board has invested in a substantial rebranding exercise of the fleet of 70+ vans and cars our highly qualified Engineers use, rebranding SCCUK into Airedale Technical Care. So look out for a “Big A” van on the road or just as likely visiting one of your sites soon and click here to take you to our dedicated Airedale Service & Maintenance section of this website.